Commodity Trader's Almanac is now Seasonal Sector Trades! Seasonal Sector Trades: 2014 Q2 Strategies is a comprehensive strategy calendar detailing the trades to evaluate at key points in April, May, and June, based on historic tendencies and cycles. Concise and to the point, this report alerts readers to major trade opportunities by describing monthly price tendencies for each market, along with in-depth analysis of major trades and the underlying market conditions. The trading ideas are accompanied by data that allows for informed trading decisions, and precise dates are given for trades with the highest historic profitability percentages. A complete seasonal investment strategy can take years to research and compile. Markets must be monitored and analyzed, and their behavior must be correlated with outside factors. Along the way, opportunities are missed and money is lost. This report contains the results of all that work in an already-complete format. 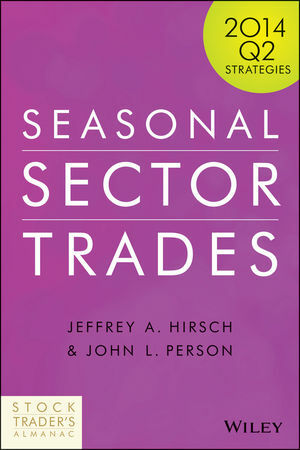 With high-level analysis and specialist insight, Seasonal Sector Trades is the industry's most authoritative guide to the seasonal tendencies of every major market. Jeff Hirsch is chief market strategist of the Magnet AE Fund, President of the Hirsch Organization and Editor-in-Chief of the Stock Trader's Almanac. He's worked with Stock Trader's Almanac founder Yale Hirsch for over 20 years, taking over in 2001. He appears frequently on CNBC, CNN, Bloomberg, FOX Business, and many other national and international media outlets to discuss market cycles, seasonality, trade patterns and predictions, and historical trends. He also edits the firm's digital service, Almanac Investor, a subscription product that provides market analysis, investment recommendations, market data, and research tools. John L. Person is a thirty-two-year veteran of the trading industry, having worked as a floor trader, broker, analyst, and founder of NationalFutures.com, an online education site. He developed the Person Pivots (PPS) and other technical indicators that are on several companies' popular trading platforms, including TDAmeritrade, TradeStation, Open E Cry, NinjaTrader,Tradesignal, and Trade Navigator. Person has taught thousands of traders including members of the largest exchanges, and frequently speaks at industry conferences. He is the author of three nationally and internationally popular trading books as well as three trading courses and a DVD seminar series. Person's latest book, Commodity Trader's Almanac, is the authoritative guide to trading the seasonal aspects of the commodity markets and the correlated ETFs and stocks of those markets.